Elia Alba’s installation for Sweety’s Radio: Edición Especial will include three videos, Unruhe, Se Revela, Se Devela and Gigglers, all made between 2001 and 2010. These works show Alba’s manipulation of reality as fantasy and vice versa, always within a societal framework informing this dynamic. In Unruhe, Alba focuses on this German word, meaning unrest, to compose a dream-like scenario, using Super 8 and video, during which dolls are aggressively handled as they float on and move through the water. Se Revela, Se Devela expresses the idea of unmasking as a cultural practice that both contains and sustains the face. 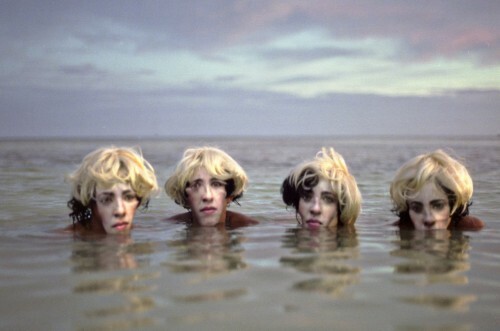 Gigglers, filmed on IslaMorada, examines fractured identities and adolescence through the laughter, play and the undeterred stare of four young girls wearing masks and wigs, floating in the ocean. This project is the fourth installment of Sweety’s Radio: Edición Especial, on view through July 30, 2017. Brooklyn-born artist Elia Alba is a multi-media artist working through video and performance. Her latest project entitled “The Supper Club” gathers cultural makers to examine race through food, dialogue, and portraiture, culminating as a solo show forthcoming fall 2017 at The 8th Floor.